You try to login a new device into your Wi-Fi network after ages. Or maybe when you try login in your friends tablet to your Wi-Fi network, it keeps saying password error. Do you think you have forgotten your router password? 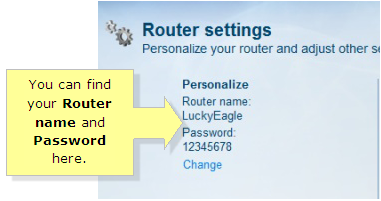 If yes, then let us have a look at how to find router password in the following paragraphs. Go Settings and select Wireless network. Right click on the wireless network name and select View connection properties. Choose Show characters and you will be able find your wireless network password for the router. Select your network and then choose Connect. In the taskbar, select search box and enter view network connections. In the search results, choose View network connections. Right-click on Network Connections and select Status  Wireless Properties. Choose Security tab and select Show characters. You will be able to see the password in the Network security key. If you have a device or computer that is already connected to your Wi-Fi network, then login to your router’s admin page. Go to the basic wireless network settings page. Unhide the characters and you will be able to find the password for your Wi-Fi network. In case you cannot find your wireless network password by any of the above methods, then all you can do is hard reset your password. Turn the ‘power on’ on the router and press the tiny reset button on the router device using a pointed ballpoint or pin. Continue to press for 30 to 40 seconds or until the lights on the router start blinking or flashing. Let the router restart and then open a web browser. Enter the default IP address of the router admin page. You will be prompted to enter the default username and password. Once you login to your router admin page, navigate to the wireless settings page. Here, you will need to rename your SSID network and enter a new password for your wireless network connection. The password should be at least 6 characters long and consists of a combination of capital and small letters, numbers as well as special characters. Click on Save and the new password will take effect immediately. This is the way you find your router password in order to allow new devices to connect to your wireless router password. Its true and a right way. Kisi ne change kardiya..os ne apna p.word daal diya..ab hum majbor hein..? how to hack internet to other venor WiFi router?? I don't know my route password. How I'll get it? I didn't route password please help me ? I have a proublem i have been reset my router now my password has been finished but now i can,t login in router i have been try many time to enter by dailing 192.168.1.1 and .o.1 but every time i am failed i enter name admin and also password admin but every time pc showing a dailog box adderess bar can,accept this ip now what to do for login and chaing ssid and password? ???? Sea the back of the router. Dear give me wifi hake apps. 👉🏻 *Refer ID : 4987702* (four nine eight double seven zero two). I wan't to hack my neighbour's wifi password. Can you help me.? I want to hack my wifi password.can you help me.? How to known tke wireless wifi passward . This vest post for 192.168.01. please visit I hope this post helohel for you.